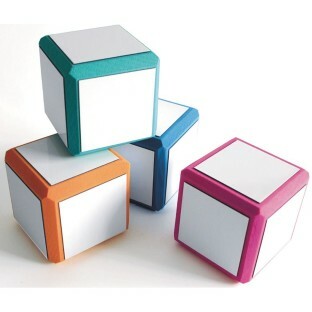 Set of 4 foam blocks with write and wipe panels on all sides and one dry erase marker. Create your own fun and games by drawing pictures, writing letters, questions, words, phrases, numbers, or a combination of them all! Assorted colors. Each block measures approx. 3” square with a 2-3/8” square write-on wipe-off surface on every side.